Plumbing problems can cause quite an uproar for a homeowner that is not familiar with fixing these types of issues. Professional plumbers can have a wait time, and are very expensive for something that could usually be solved without too much trouble. Read more to see how you can fix some simple plumbing problems! 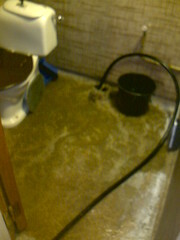 If you are experiencing sewage backing up to your toilet, it is often due to blockages contained in the lateral connections connected to the main sewage line. When your personal efforts can’t deal with such a clog, your only option is to have the line snaked out by a professional plumber. If you are looking for a plumbing contractor, take some time to check with the Department of Consumer Affairs. You can check for valid licenses and negative reviews. Do not hire a plumber with a license that is not in good standing. Avoid dumping oil, fat, and grease in your drain. These materials may be liquid when you pour them in, but they will solidify and cause problems. This is especially the case if you possess a garbage disposal; fats and oils cause blades to run less efficiently and slow. Get rid of any fat or oils outside or in the garbage can. If your pipes make squeaking and hammering noises, it may be very simple to fix. You simply have to securely fasten any pipes that are exposed. If pipes are located in the floors, ceiling or walls, a professional might be needed for the job. During the coldest winter months, you should keep exposed pipes warm to avoid freezing. If the weather is very cold, your exposed pipes are likely to begin freezing. Even pipes located inside of the house can freeze. To ensure your pipe do not freeze, and sometimes burst as a result, use a small heater or a heated lamp direct on areas susceptible to freezing. Use filters on all drains to prevent debris that might clog the pipes from getting through. Thoroughly clean the strainer on a regular basis. The ones in the bathroom can be cleaned out as needed.